The Sensel Morph is a pressure‑sensitive multi‑touch control surface which first emerged as a Kickstarter project in 2015, though initial prototyping took place as early as the end of 2013. The Kickstarter goal was over‑subscribed by a factor of four, so clearly there’s demand for a product of this type. (The only other similar device is the French‑built Joué.) So, what makes the Morph appealing in a scene that’s already inundated with numerous MIDI controllers and iPad instrument apps? The Morph ships in a minimalist, Apple‑style white box, and opening the box reveals something which looks very much like an iPad: a thin, featureless aluminium slab 240mm wide by 170mm deep. (That’s the same width as my iPad 3 and maybe a centimetre less deep.) Most of the top surface is a featureless matte black, apart from a raised ridge at the back. A quick inspection of the edges of the device reveal a power button and a micro‑USB socket, plus a narrow window to facilitate Bluetooth wireless. The naked Morph.The Morph is largely inert until one starts applying overlays. An overlay is a textured flexible silicone surface which fits over the black area of the Morph, snapping into place and held there by magnets. The overlay dictates the function of the morph: change the overlay, and the device changes its function. Several overlays are available: we were provided with overlays for Piano (two octaves of piano keys), Drum Pad (seven percussion pads) Music Production (a mix of 4x4 drum pads, knobs, sliders and one‑octave keyboard), and a QWERTY keyboard. The existence of Gaming and Video Editing overlays suggest that the Morph is aimed at a range of creative activities; an additional ‘Innovator’s Overlay’ is a blank template for developing new functional layouts, and the Sensel site provides information on printing your own. At this stage, given that the Morph is very similar in shape and size to an iPad, you are probably wondering what it brings to the table over an actual iPad running some kind of MIDI‑generating control template app like Lemur or TouchOSC. The main advantage of the Morph is sensitivity: it claims a very high dynamic range, able to sense anything from brush strokes to drum sticks. It also claims to be pressure‑sensitive with high positional resolution, and to have very low latency, down to 2ms. Certainly, in a side‑by‑side comparison of the Morph with Music Production overlay against an iPhone 6S running Lemur over lightning cable, the Morph’s response felt close to instantaneous (certainly as good as a physical MIDI controller), while the iPhone was characteristically a bit laggy. A second advantage of the Morph is that the overlays are textured, or more accurately, the specific ‘controls’ on an overlay are raise or ridged, so that your fingers fall into the right position, and you don’t have to constantly look at the control surface to make sure your touch hasn’t drifted. In normal use, the Morph would probably be tethered by USB to a host running the app to be controlled (DAW, sketching program, whatever). It also supports Bluetooth LE, as we’ll see later. In most cases, no drivers are needed — the Morph is able to adapt itself to be whatever kind of USB device is appropriate to the overlay. Apply the QWERTY keyboard overlay and the Morph is a USB keyboard. Apply one of the music control overlays and it becomes a class‑compliant MIDI source. In fact, this adaptation is hybrid: it’s possible to configure an overlay which generates a mixture of (say) keyboard shortcuts and MIDI messages. Where the overlay was less successful was in the responsiveness of the keyboard trackpad. A certain amount of pressure was needed to move the mouse pointer, while extra pressure was used to signify a mouse click — there was no ‘tap’ gesture to indicate a click. Overall, the keyboard was usable in emergencies (or as an iPad add‑on), but was let down by the poor trackpad response. Time to get back to musical applications. First, the Drum Pad overlay. Although the overlay appears to only have seven pads, all but the biggest are split into two zones, so 13 notes are available. The pads trigger as you’d expect, with decent velocity response, but the Morph is also capable of sending glide and pressure controller information, so after a moment’s MIDI configuration the pads were duly sending pitch‑bend and aftertouch messages where appropriate. The Morph is fully MPE‑capable if you have an instrument or DAW which responds to this. (I used ROLI’s Equator synth for testing.) The sensing surface of the Morph can actually be reconfigured behind the scenes to run at a higher timing resolution — with the Drum Pad overlay in place, this happens automatically, to get the tightest response. The Morph also supports a high‑resolution mode for position, which kicks in for artist sketching overlays. The Drum Pad function keys are mapped by default to scene change (transposition by one ‘grid’ or 16 semitones), velocity/pitch‑bend enable/disable, and a handful of transport controls. Function keys with on/off modes have their state indicated by the LED strip. The keyboard overlay.Next up, the Piano overlay. This provides a layout of two octaves of ‘keys’, C to B — there is a top C, but it occupies a thumb‑sized region at the bottom of the highest B key, which seems like a bit of a hack. (This layout does, however, allow two Morphs to act as a four‑octave keyboard.) At the very front of the keyboard is a long narrow sustain control. The keys are raised slightly from the base of the overlay, and the black keys are raised slightly higher than the white ones, so there is a vague feeling of a ‘real’ keyboard when playing, although the keys don’t move. When a key is pressed, the corresponding white LED flashes in response. (It would be good to have an option where the LEDs stay lit while keys are held.) Again, MPE worked fine, generating polyphonic pressure and two dimensions of glide, though the left‑right control was less extensive on the black keys, and up‑down control was constrained on the top thumb‑sized C key. Release velocity is also supported. 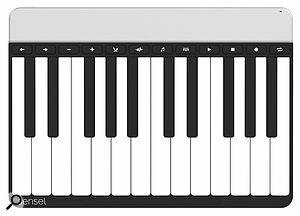 The function keys are much the same as for the Drum Pad overlay, but with octave selection, and chord and sustain features. The keyboard was surprisingly playable, with the raised black keys and the narrow gaps between the white keys providing just enough tactile hints to keep the fingers on target. Response was quick and accurate. The Music Production overlay is a bit of a hybrid, sporting a 4x4 drum‑pad grid, eight rotary ‘knobs’, two horizontal sliders and a small one‑octave keyboard. The drum pads and keyboard can transmit the full set of MPE control values. When a knob or slider is active, the current value is indicated on the LED strip. The rotary knobs are outlined with ridges which act as finger guides, making them much more accurate when tracking touch than might be expected. 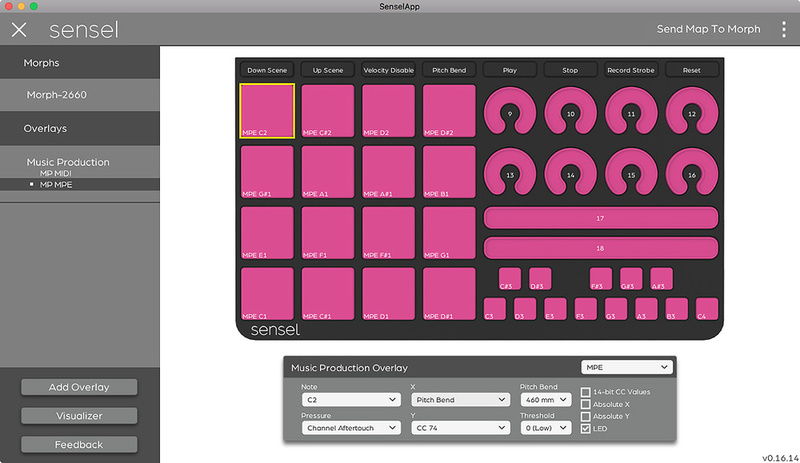 The Morph comes with a dedicated Sensel application for configuring overlay presets and sending them to the device. At this stage it’s probably worth going into a bit more detail on how presets are activated as overlays are physically put in place. Every overlay has its own pattern of magnets which indicates to the Morph which preset to activate. The Morph can be loaded with multiple presets, one for each overlay, and it switches between them as overlays are changed. Edit an overlay preset with the app, load it into the Morph, and it becomes associated with the appropriate overlay, even if the app is not running. When the app is running, it gives an indication of which of its library of presets, if any, corresponds to the preset loaded in the device for each overlay. The app ships with a few alternate presets such as MPE‑ and non MPE‑capable setups for the Piano and Music Production overlays. The Sensel application showing the configuration panel for the Morph’s Music Production overlay. All overlay presets are editable to an almost ridiculous degree. The Piano overlay can have note pitches rearranged, and pressure can be mapped on a key‑by‑key basis to channel or polyphonic aftertouch, or any MIDI controller. (Channel aftertouch seems to be sent independently for each key, rather than for the keyboard as a whole, limiting its usefulness.) You can also rearrange the key layout for the QWERTY keyboard overlay, although that would be rather confusing. On all the music overlays, controls can be individually configured for MPE, although you’d probably want this to be all‑or‑nothing. (Equator certainly didn’t appreciate being attached to a device sending a mixture of MPE and non‑MPE data.) The app unfortunately lacks an undo feature, although it’s possible to save and revert the state of a preset, and they can also be exported to and imported from disk (via rather clunky save/open dialogue boxes). Even so, reconfiguring an arbitrary control or key on an overlay leaves you with no immediate method to set it back to its previous state, making experimentation awkward. The app also comes with a ‘visualizer’ page which dynamically renders a 3D view of a surface showing how much pressure is being applied to the Morph, regardless of which overlay might be in place. (The Morph generates raw data for all contact points, whether the overlay has a control under a contact point or not.) The visualizer would probably be most useful as a debugging aid to make sure the Morph is functioning correctly. Like many innovative controllers these days, Sensel has dedicated support in Cycling ’74’s Max/MSP. Max can communicate with the Morph directly, regardless of any overlay that’s in place — in fact, it appears that overlay‑based MIDI is disabled when Max’s Morph support is running. (You probably want to remove any overlays, to avoid inaccurate triggering due to any bumps or contours.) There’s a high‑level ‘sensel’ library object which tracks multi‑touch, delivering absolute X, Y and pressure location for each finger — sensitivity can be adjusted. At a lower level, a ‘jit.sensel’ object outputs pressure data from the entire sensing surface as a Jitter matrix, ready to be incorporated into any number of dynamic image‑processing Max patchers. I was originally rather skeptical about the Morph, not being convinced that it delivered much more than an iPad, which you probably already own. However, it distinguishes itself by being robust, highly responsive, and tactile: the overlays are textured with relief patterns that make the device more playable than the flat glass screen an iPad provides. While some aspects of the Sensel application are a little unpolished, it does provide a lot of configurability, and MPE support is good and solid. 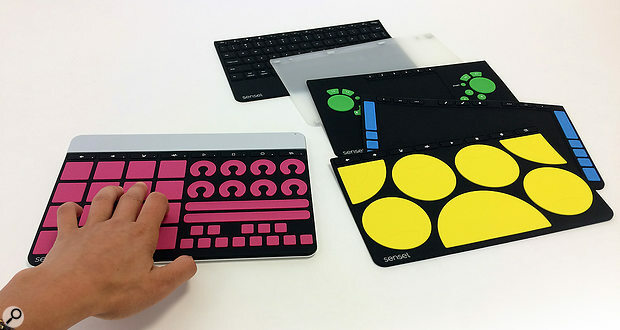 If you’re after a tactile interface that provides better response and physical feedback than today’s tablets, the Sensel Morph may be for you. High degree of configurability, mixing MIDI and USB interfacing. Function keys not very responsive. QWERTY keyboard trackpad not convincing. Piano keyboard has a small top C key. App needs some usability improvements. 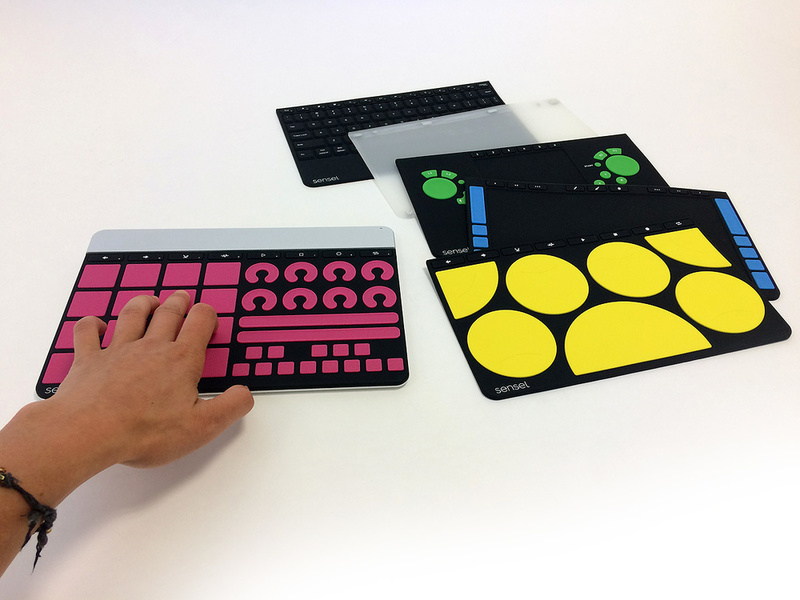 The Sensel Morph is a multi-touch control surface that is dynamically configured by attaching textured silicone overlays, providing a wide selection of USB and MIDI functions for music production and design software. It is highly responsive to playing technique and highly configurable as a MIDI device, although the bundled configuration software has a few rough edges, and the piano layout compromises its top C key. Sensel Morph with one overlay $299. Individual overlays $35.